Created to protect Russian airspace from foreign intruders, the Rocket Reds are soldiers sporting powerful armored battle suits that grant them the ability to fly, shoot plasma blasters, and use mecha-empathy - the power to sense and control electronics. Continuously upgraded with the newest technology, the Rocket Reds are an extremely proud fighting force, willing to sacrifice everything to protect the land they love. 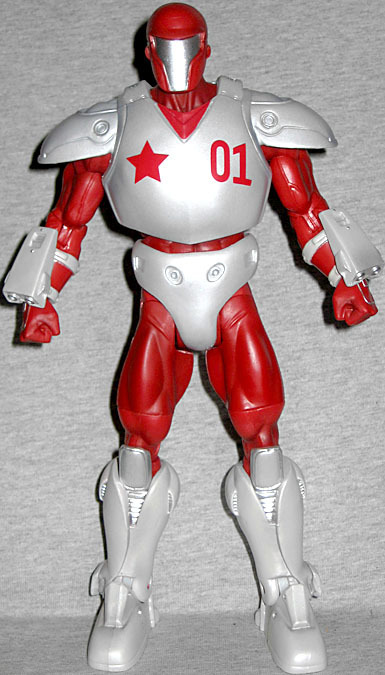 Rocket Red uses a build-a-figure body, for some reason - the one introduced with Atom Smasher. It's not really clear why he uses a BAF body. 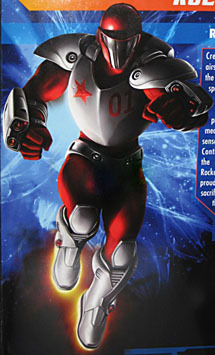 The original Rocket Red armor was equivalent to the Iron Man Mk.1 suit: powerful, sure, but chunky, boxy, and most of all, basically human sized. The Rocket Red Brigade are guys wearing armor, not guys piloting mecha. And knowing that, 9⅜" is just too big. The design of this figure has drawn some ire from the fans: if the DC line was ending in favor of figures based on the New 52 designs, and the DC Signature Collection was meant to provide us with the more "classic" versionr of characters, then why is this figure in this armor rather than the old boxy one? And that's an understandable complaint - the Justice League International version of the character is the most well-known, after all - but this isn't the New 52 armor. This is what the Rocket Reds wore after the "One Year Later" jump. For instance, look at the cover of Checkmate #24; that's this armor. The suit is red and pearly white, with a silver faceplate. There may also be some silver on his knees and the "ports" on his suit, but it's hard to tell: it reflects light the same way as the white, so there isn't much contrast there. 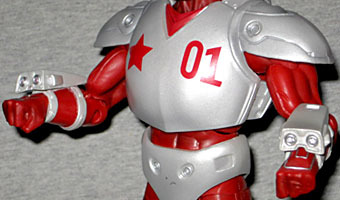 There's a red star and a big "01" on his chest that reveals we're looking at a guy named Maks Chazov in the suit. The head isn't the only new piece on this figure. The armor on his torso is just an add-on over the normal BAF body, but his shins, feet, forearms and hands are all new. The costume details are all quite close to the comics - he's got the plasma blasters on his wrists and big exhaust ports on his back, and all the smaller details on the suit can just be chalked up to artistic license. "Oh no, the boots don't dip down as far as they should in the back!" Whatever, artists draw things differently all the time, we can accept that the minor details may have changed. We will note, however, that he should really have two red stars on his back. 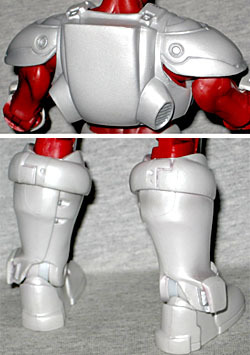 Rocket Red has all the usual Mattel DC articulation: hinge/rocker ankles, hinged knees, swivel thighs, H-hips, swivel waist, hinged torso, swivel wrists, hinged elbows, swivel biceps, swivel/hinge shoulders, and a balljointed head. The shoulder armor does get in the way of the arms a little bit, but you could already tell that just by looking, so it shouldn't come as any surprise. The portrait on the back of the box, by Mike Thompson, has some very strong lighting effects. He looks like he's flying through the beam of a floodlight, with all the illumination in the piece coming from beneath him. The art is clearly based on the toy, because it has all the same design quirks as the sculpt (well, maybe DC provided control art that they're both based on, but you know what we mean). There are more stratches and dings in the art than on the actual toy, but that's to be expected. This is not the "New 52" Rocket Red - it absolutely came out of the pre-reboot comics - but that still doesn't mean it's the version of the character that anybody wanted. Maks Chazov isn't the man fans think of when they think "Rocket Red"; they think Dmitri Pushkin, and so they want Dmitri's armor. It's like when Hasbro says they're releasing a Crimson Dynamo figure, and then he looks like this instead of this. 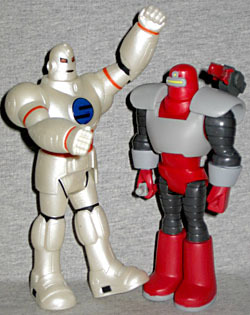 Come to think of it, the same thing happens with Titanium Man, so we're left to ask: what is it about Russian guys in armor that says to toy companies "whatever you do, make sure you don't get this right"? And while we're asking things, what possessed Mattel to make this a BAF instead of the proper size?